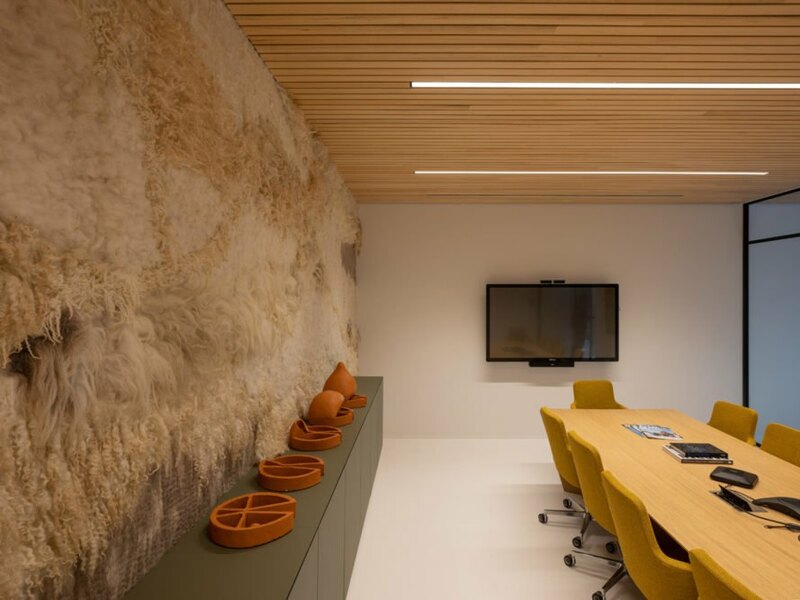 Dutch firm Team Paul de Vroom + Sputnik has just completed work on a beautiful, light-filled office in the Netherlands. 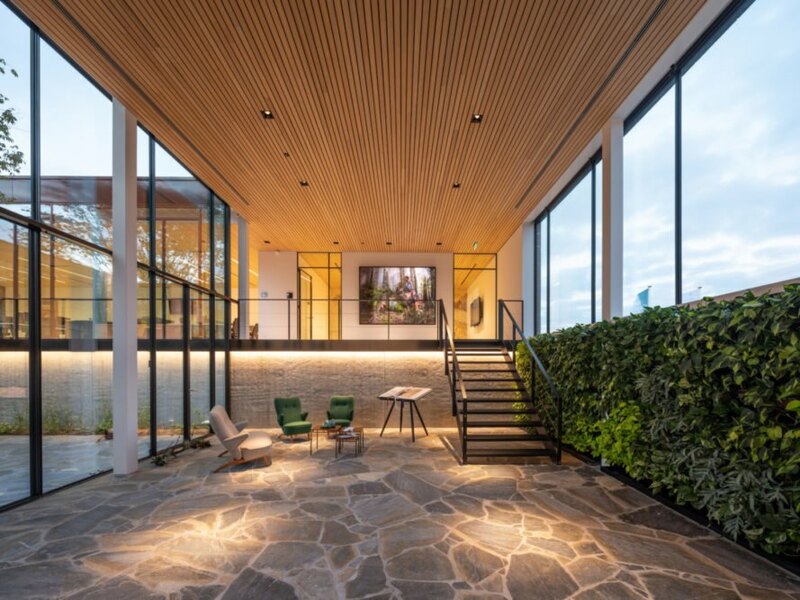 Built around an open-air patio, the Big Green Egg’s new European office is designed to foster an inspiring work environment. 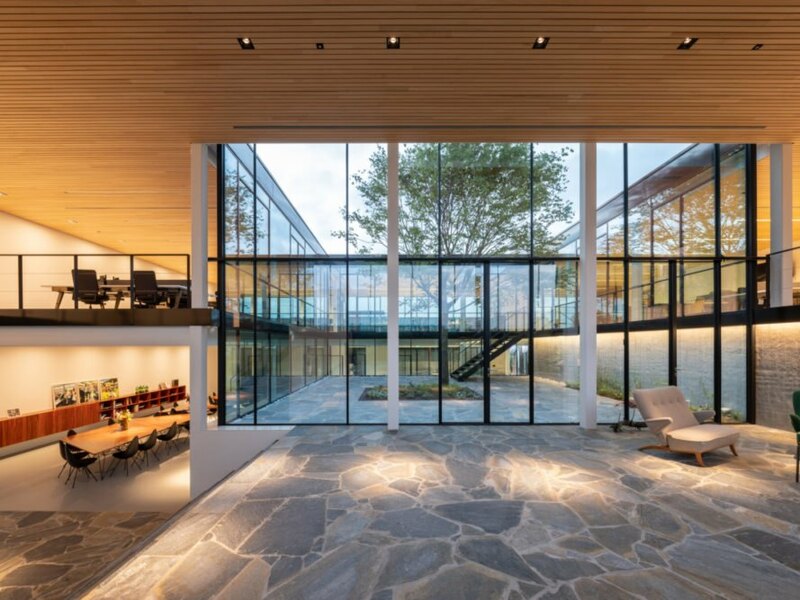 Additionally inspiring, however, is the building’s sustainable profile, which includes solar panels that make the building 100 percent self-sufficient, a gray water collection system, natural building materials and a large green roof. The architects worked closely with the Big Green Egg Europe team to create an office environment that was vibrant and healthy. The volume of the building is quite humble, a square, two-story volume clad in brick. 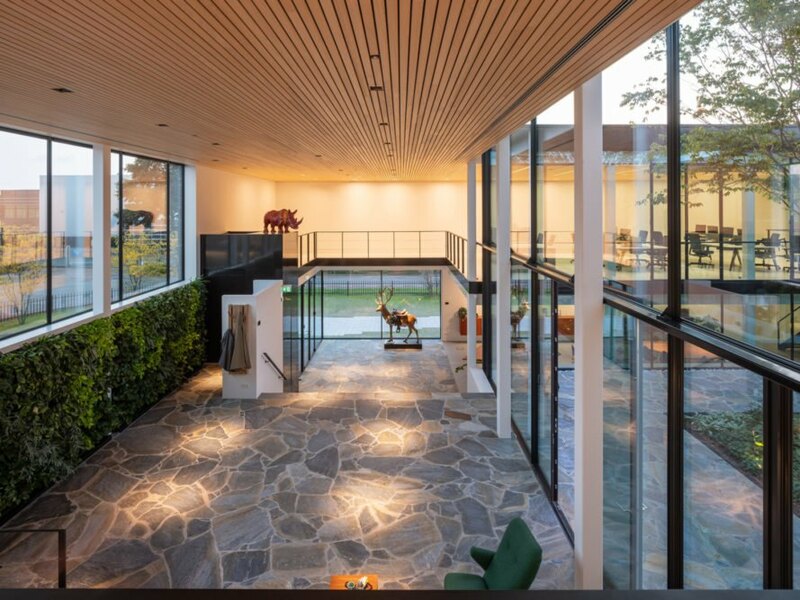 However, the combination of natural building materials such as stone and wood offer a strong connection to the environment. 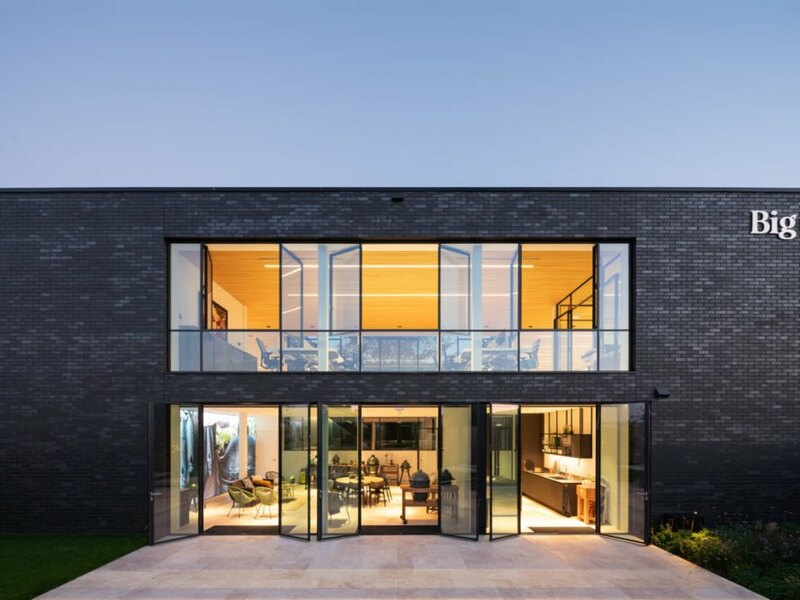 Massive glazed facades flood the interior with natural light. The office space generates its own electricity as well as energy for heating and air conditioning thanks to a rooftop solar array. Additionally, a green roof runs the length of the building and is installed with a rainwater collection and storage system that is used to irrigate the building’s landscaping. At the heart of the design is the open-air central patio. This space was designed to offer employees an outdoor area for casual meetings or simply to take in some fresh air under the massive tree that sits in the middle of the space. 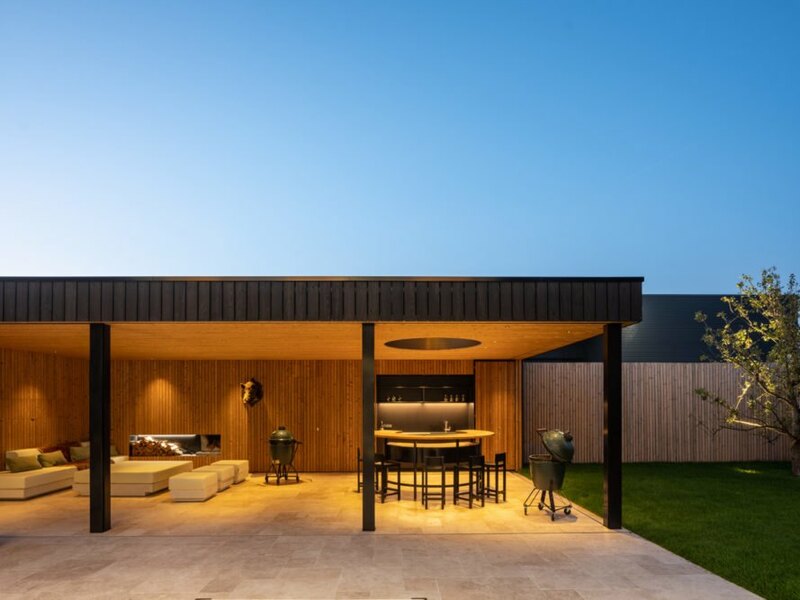 Additionally, the patio is designed for entertaining and is the perfect place to highlight the company’s famous high-end ceramic barbecues. On the interior, each room is tailored to a specific use but with flexible features. There is ample space for formal conferences as well as smaller offices for teamwork sessions or private phone conversations. Natural flagstone flooring runs throughout the interior to give the space continuity. The smaller rooms also have custom-made dynamic wall furniture that provides optimal versatility depending on desired use. Within the walls, there is a pull-out desk and bench that can be extended depending on the number of seating spaces needed. To add a bit of whimsy into the interior design, there are fun animal statues throughout the space and even a boardroom wall covered in soft felt. 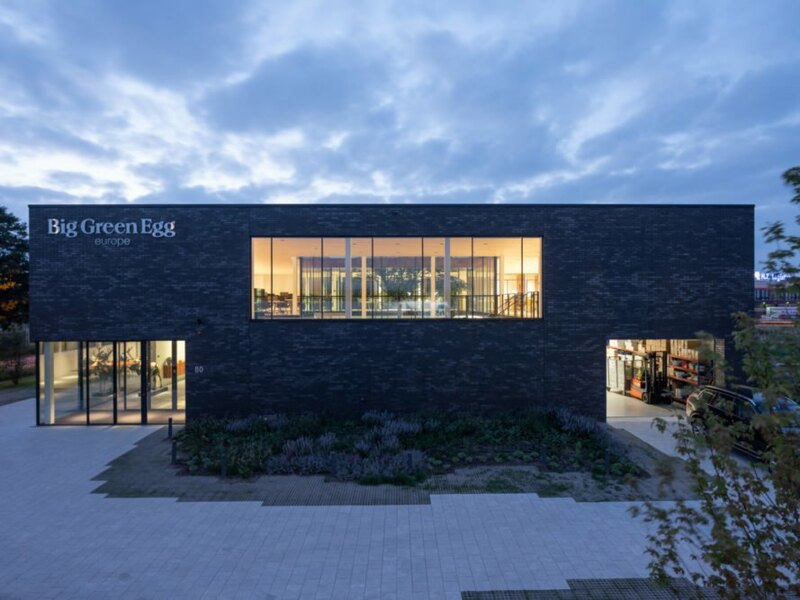 Dutch firm Team Paul de Vroom + Sputnik has just unveiled the design for the Big Green Egg's European office. The office design was created to provide an inspirational work space for the employees. The building is clad in brick and has two stories. From the exterior, the building looks like a humble square structure. The interior is designed with all natural materials including stone flooring. 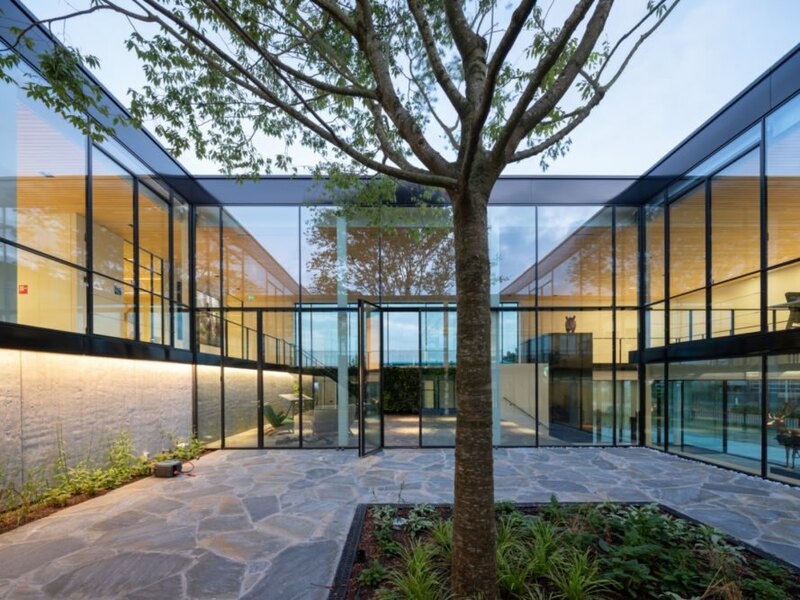 Large glass panels flood the interior with natural light. The building is designed around an open-air central patio. The patio wraps around a large tree. The interior has a strong connection with the outdoor space. The inside of the office is bright and airy. The main boardroom has a wall made of felt. Fun materials and features were used to give the working space a touch of whimsy. Interior spaces were all custom-designed to be as flexible as possible. An open-air seating space provides fresh air for the employees.